Weblog (maintenance courtesy of Phil's niece Carrie Eiler). 2003: empenage, start of wings through drilling ribs and spars. 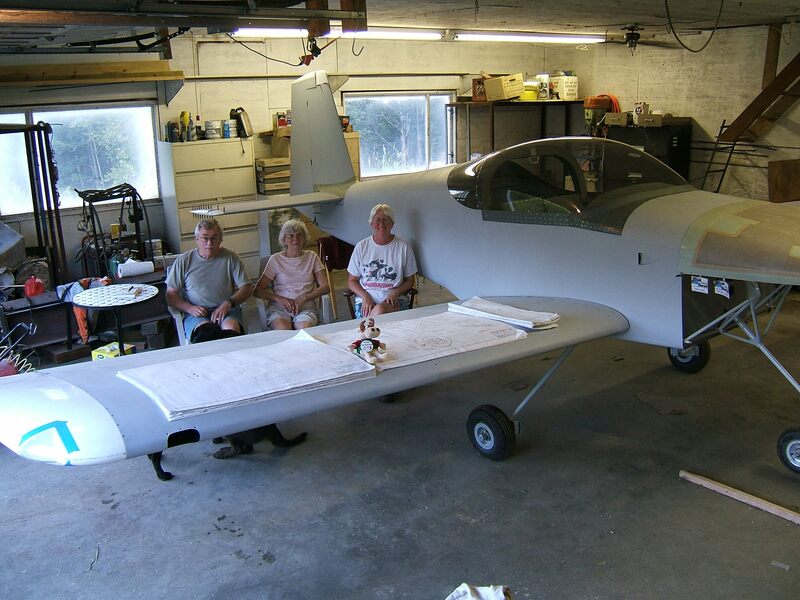 4q2004:fuselage/wing fuel and vent lines, fuselage/wing fairing, return assemblies to house for winter, forward fuselage drilling, aft fuselage top skin, brake line routing in fuselage, elevator trim cable fitting. 1q2005: roll bar jig and roll bar fitting and drilling, terrain avoidance mod test using kflog, open source synthetic vision development starts with FlightGear, van's roll bar service bulleting work, pitot line work, airspace file work using DAFIF to generate 3d view of airspace boundaries, platenut wing roots, main longeron , riveting in the forward canoe area, finishing kit arrives. 2q2005: canopy hinge and canopy release parts, jigging router for 1/8 slot in fuselage for canopy open/lock handle, canopy frame small part machining details, preliminary riveting of canopy frame structure, canopy plexiglass cutting and fitting using some simple jigging, fitting canopy to frame, install engine mount, drilling canopy stiffeners in place, platenut riveting for brake lines in fuselage, drilling plexiglass main canopy to frame, drilling rear canopy to fuselage/roll bar, canopy small part machining and fitting details, air vents, forward fuselage riveting and special bucking bars, seat belt drilling, preliminary work on canopy faring instead of fiberglass, riveting on aft fuselage top skin, pattern development on canopy, rivet seat belt mounts, hand form of front skirt/mount for canopy in liue of epoxying in place (will make maintenance and painting much easier), canopy drilling along sides of canopy, drill canopy to skirt, tricky riveting sequence of top skin on canopy frame and skirt, prelinary investigation of gps hardware to linux interfacing. 3q2005: special modifications to bucking bar to finish tricky riveting of skirt and canopy skin to canopy frame, linux/microprocessor investigation with sensors, move plane to garage and assemble, fiberglass work on empenage , then platenut fiberglass mounts in fuselage, hand form ribs for closing off fiberglass on empenage, el cheapo paint booth fabrication, initial crossbow sensor investigation, aileron stop machining and fitting. 4q2005: wing root fairing fitting and root fair platenut installation, scotchbrite, alodine wings and prime wings,scotchbrite, alodine and prime fuselage, assemblies including fuselage back into house for winter, preliminary demonstration of synthetic vision using crossbow sensor interfaced to a linux box using FlightGear to manage rendering. generation of airspace data for 3d display in flight gear, car testing of synthetic vision display. 1q2006: ADC work and sdcc compiler, synthetic vision, HUD development, adc interfacing for fuel tanks, mock up of flight computer in cockpit, shuttle development pc, Daedalian's Society presentation, USB interfacing, Open Eagle synthetic vision developments on display of federal airspace elements..
2q2006: Moving fuselage out of house, OpenEagle development, sensor interfacing, rudder stops, horiz/vert. stabilizer fiberglass end details, (including hand formed ribs to close fiberglass ends),flop tube A/D tank sealing and testing, wingtip installation fine fitting..
1-2q2008: Move to Flagstaff Arizona. 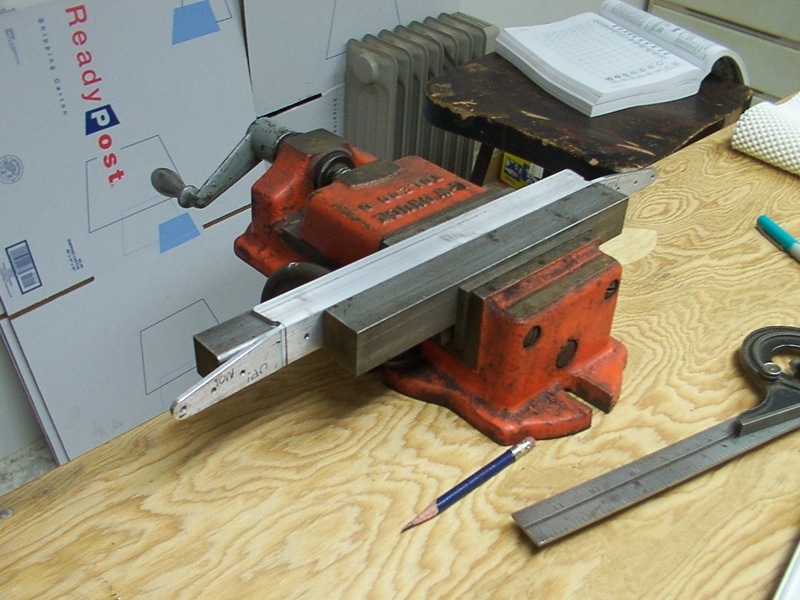 12/24/03: Milling the rear spar mods for the RV-7A wing (Dwg 38 rear spar detail). CNC gang milling of W-707D and W707G plates. Move the vise a couple degrees and you can do a square nice square corner with a CNC controlled radius. Came out very nice. 7/5/04 Simple device for adjusting the bend on the main longeron. 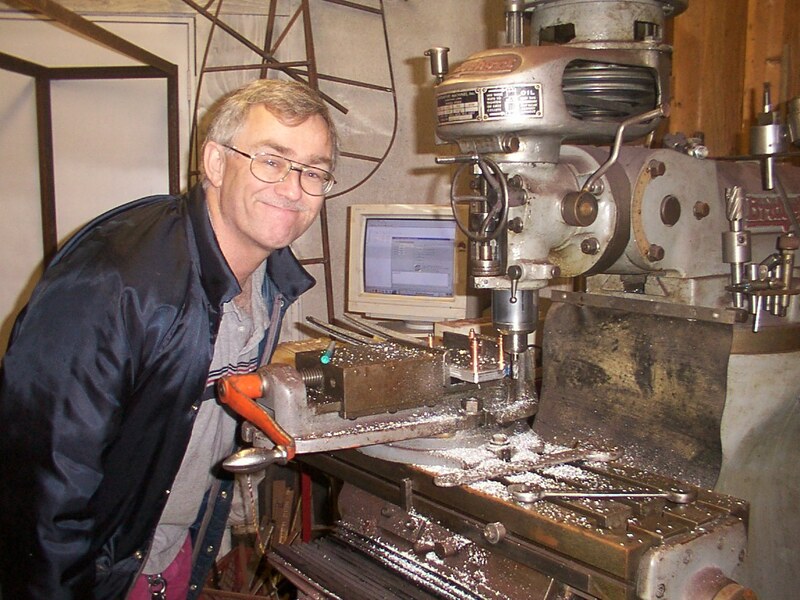 7/17/04: CNC milling, and milling fixture to mill the notches in the F-768D Seal Support Angle. Uses clecoes to hold the angle in position. Sure beets fiddling around with a drill press and hand snips. 7/18/04 CNC milling of F-793 Vent Brackets with small fixture. Nice clean way to get the 1-7/16 radius milled in. 7/21/04 CNC milling of drill for drilling hinge stock. Takes about three or four variants to do all the hinge work for fabricating the seats and floor mounts. 9/10/04 Drill jig to make sure the rear spar attachment hole is (1) Square and (2) reamed to a nice line fit). 1/2/05 Simple plywood box jig for drilling the Roll Bar parts in alignment. 1/5/05 CNC milling the 1-1/2 inch hole in the rear of the roll bar. 1/10/05 CNC milling of the slots in the C-702 Tip Up Canopy Forward Skin so the canopy release mechanism will work. The trick is to take a piece of plywood and attach it to a 2x4 and put that in the mill vise. Then CNC drill the rivet hole pattern in the area of the slot so you can cleco the sheet down to the plywood to mill the slots. Works great, Nice clean slot. 4/10/05 CNC mill the tricky little stiffener C-723 called out on Drawing 48 for the tip up canopy frame. The trick is to machine the part from a section of angle. 5/1/05 CNC milling the links to connect the rudder cable to the rudder pedal. Uses a section of angle and cleco's to hold the link to mill in a nice radius on the link ends. 5/9/05 Setup for grinding the slots in the various steel tubing parts used in the canopy release mechanism. Sure beats breaking1/8 inch end mills trying to machine that high strength tubing. 5/12/05 C-725, C-728 CNC milling of canopy details. 9/11/05 Use of a hardwood form to form ribs from 2024-O for the HS-615 Horizontal Stabilzer and VS-909 Vertical Stabilizer tips. 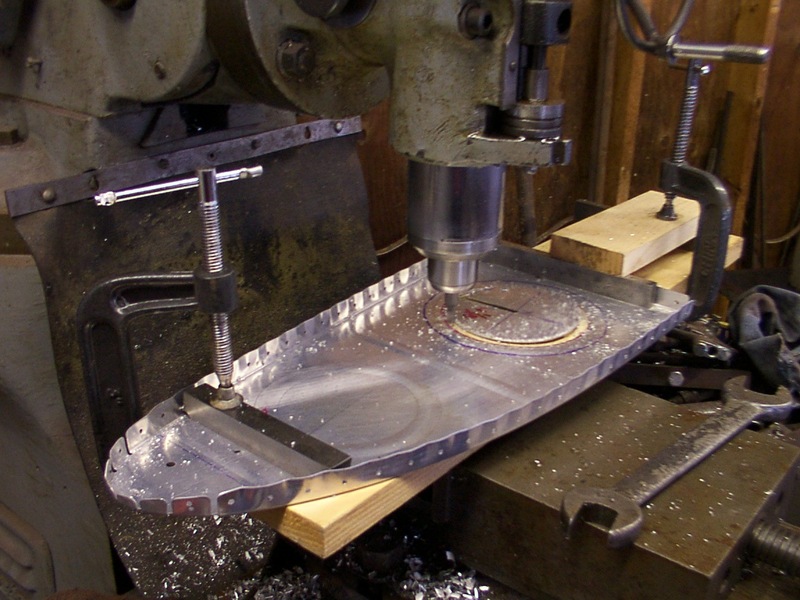 8/1/06 CNC machining of mounting plate to attach Whelan Strobe/Beacon to R-111 Rudder Bottom. Here is how it looks epoxied into place. 8/6/06 CNC mill and drill nutplate attachment plate which is in turn epoxied to the inside of the wing tip to for attachment of the Whelan Position/Strobe lights. 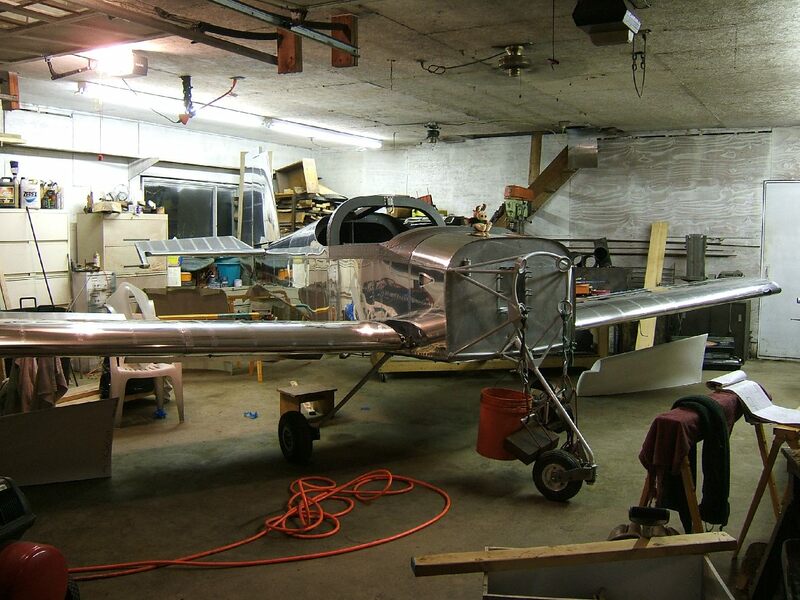 The objective is make sure the strobe/position lights can be serviced without having to take off the wing tip.